The students in my master cane workshops often choose to keep in touch through some kind of project after the workshop has ended. 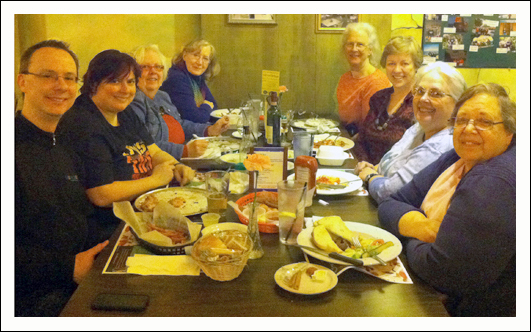 Most groups have shared slices of their canes and exchanged pictures of the kaleidoscopes they’ve made from them. Other groups have swapped finished pendants. One group even had a reunion workshop to do more caning. Donna Harryman (who suggested the swap) made 1” diameter lentil-shaped bead blanks with holes in them and mailed them out to all the swappers. This ensured the beads would be the same size and shape and have paired holes in the same positions for stringing. I didn’t have any slices of my cane left so I had to make a new one. This presented an opportunity to try something new. 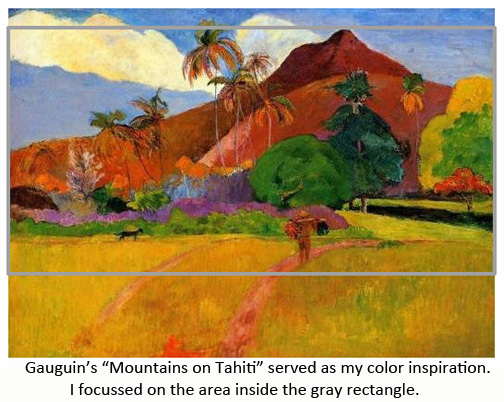 First I used a new color palette inspired by Gauguin’s painting “Mountains on Tahiti” (below). The cane on the left is the size I usually use for my 2″ kaleidoscope pendants. The cane on the right was used for the 1″ Kaleidoscopes for the swap. Tiny triangular sections only 1/2″ high were cut, mirrored and combined to form the kaleidoscopes. After the 1″ beads were sanded and buffed, they looked like this. This entry was posted in Caning, Color, Kaleidoscopes, Premo Clay, Sources of Inspiration, Teaching, Technique. Bookmark the permalink. It Still amazes me every time !! Goodness, your kaleidoscopes are just astonishing, Carol… your students cannot be faulted for wanting to continue the magic! I love your canes, your work is truley unique and beautiful. I started doing clay, almost on a daily bases, a year ago last October. I just started learning how to do canes, I love it. I joined the Cane Builder with Meg Newberg. She sends out on a monthly bases the information you need to make a couple of canes. I have learned alot but I need to learn alot more. I just totally love it. I think I am addicted to clay! Welome to the club, Judy. We’re all addicted. I’ve been addicted for 18 years. You should be proud of how you inspire your students artistically AND personally. Your exaple of generosity makes us want to share with each other. I’ve made 10 of my 14 circles. Can’t wait to get them done and start receiving the swaps. You all inspire me as well! Hi, Alex. It’s like Christmas in July, isn’t it? And we’re the little kids anxiously awaiting our presents! They will be wonderful together! I’m just wondering if you show anyplace how you cut up your main cane to create your fabulous combinations? If its in a class and you can’t spill the beans, I do understand. (I might just try it anyway and see what happens) GRIN. Thank you Pam. I will be doing a Powerpoint presentation on how I cut up the canes as part of my Master Class in Laurel MD at the end of this month (see my schedule). I will be teaching the full 6-day workshop in your area (Racine, WI) in October 2014. Carol, your work just takes my breath away. 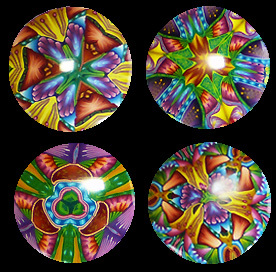 just fantastic….i love tiny kaleidoscopes!!!!!! I think that I am very lucky to find your website. Where are you located ? I live in Aurora, CO. real close to Hobby Lobby, thank goodness, in case I need a clay refill. I would love to learn some new things so if you have anythng new just throw it my way. Do you only use Premo for your creations? I would love to learn how to do those tiny kaleidoscope canes. What do you charge ? Well, I will talk to you later and have a wonderful day. Good afternoon Carol. Thank you so much for your generosity in putting so much on your website. Your creations are fabulous! A tentative question: those of us who live at the bottom of the world in New Zealand with no possibility of attending any of the wonderful workshops available to you northern hemisphere folks, are entirely dependent on DVDs , books and the web for instruction, and I do wonder if you have any plans to video any of your master classes and make them available for a wider audience. I’m sure there would be many like me who would snap them up at any price given the chance. I think I read that you may be in the process of writing a book and that will be wonderful if so, but the chance to actually see you manipulating your canes to make all those amazing variations would be brilliant. Apologies if you’ve already talked about this and I’ve somehow missed it. I live on an island and our internet connection is not the most robust, so some things do seem to drop off before we get them. More than compensated for, by escaping the rat race, however! Right now I’m traveling and teaching so much I don’t have the time to write a book or record DVD’s. That is something I’m planning to do when other things slow down, probably in the not-to-distant future. Thank you Carol. I’ll look forward to it! Tks for share. I love your work.